How to make Bath Buns. 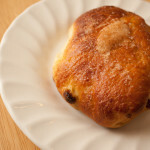 These buns are fruited with sultanas and mixed peel, with a bit of lemon zest. They work well as standard buns or sliced and toasted.